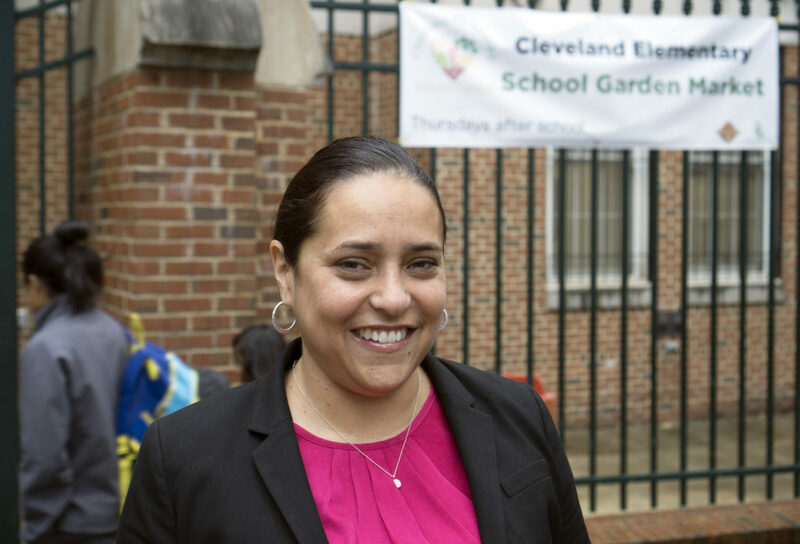 Anna Krughoff is the Principal of Cleveland Elementary School, a Turnaround for Children partner school in Washington, D.C.’s Ward 1. Principal Krughoff was nominated by Natalie Smith, Ph.D., Turnaround Partnership and Professional Development Director, for being proactive in ensuring schoolwide systems at Cleveland are working in service of *all* children. To that end, Principal Krughoff has established a Social-Emotional Academic Development (SEAD) team to plan, communicate, implement and monitor schoolwide initiatives. She has facilitated sessions on brain science, trauma-informed principles and relational trust. Principal Krughoff led her team in developing the following Proactive Behavior Plan purpose statement: “We will promote student engagement in learning by ensuring a safe, predictable, calm, and nurturing environment,” and has partnered with Mary’s Center, a community-based mental health partner to meet the needs of students impacted by adversity and trauma. THE 180: Did you always know that you wanted to work in education? ANNA KRUGHOFF: Yes, I’ve always known. I used to line my dolls up, coming home from school or going to class, starting when I was really young. THE 180: What is it that gets you up in the morning to do this work? ANNA KRUGHOFF: My 307 scholars. They’re really my why behind the work. The connections to our community and to the world and to the school are very powerful for all of us. THE 180: Was there an important relationship in your life that helped you to become the person that you are? ANNA KRUGHOFF: I was a teacher for many, many years, and I’ve always worked for strong administrators and leaders. In all the schools I’ve been in, public and international schools, the admiration I had for leaders from the seat that I sat in as a teacher really drove me to become a school leader myself. The principal when I did my internship for my Master’s in education administration trusted me to run the building and do things when I was brand new. Having those trusting relationships with my school leaders helped me to grow and become the school leader that I am today. I have always been given quality feedback about my practice, about how to grow, both as a teacher and as a leader, too. That’s been very valuable to my growth as a professional. THE 180: Are there things that you’ve learned through your work with Turnaround that you wish you had learned in ed school? ANNA KRUGHOFF: Oh my goodness, yes! I never got any of the learning that I’m getting in Turnaround’s work in ed school. I am on a very fast learning curve here with Dr. Smith and Turnaround, onboarding through the brain science behind the work that Turnaround does and then thinking about, as a school leader, how can we weave it? How do I take all that learning and then apply it to not only an entire staff, but to students and to the whole community? It’s pretty incredible, but we’re rolling with it so fast and it’s been so well received, it’s almost like people were really craving a new set of skills. People are very excited about doing the learnings with Turnaround. Today, our staff just rolled out Kid Talk [part of a multi-tiered system of supports, Kid Talk brings together every teacher within a grade to discuss how to support students with at-risk behaviors through Tier 2 level group support. -Ed.] It was amazing to see the levels of participation and enthusiasm about talking about students’ work and data in a whole group setting. I feel really good about that. And that just happened this morning! THE 180: You mentioned Turnaround’s partnership director, Natalie Smith. How has she been a partner to you in getting this year off on a good foot? ANNA KRUGHOFF: Wow. Natalie sat with me for hours and hours and hours just thinking from her school leader lens, paired with her Turnaround for Children lens, about how this could work for us. She’s problem-solved with me. She’s coached me. Another person that’s given me really quality feedback to be able to do the work well. She has been a thought partner and also pushed me when I needed to be pushed, and that’s definitely been really helpful for me. THE 180: How has Turnaround helped you build a supportive learning environment for your scholars? ANNA KRUGHOFF: We are redesigning and revamping a system that existed but didn’t serve the needs of students. We didn’t see different outcomes for students, which is essentially what we’re really here to do, right? Change outcomes for students so that they can be successful. It’s our job to do that thinking and that work together. We’ve launched a lot of learning around the brain. People are stopping themselves when they think about how they’re going to react to a child that is in crisis or having a trauma or behavioral outburst. That’s something that I see universally across the school and that plays into a positive school climate and culture. And so pair Turnaround, the wonderful things that it gives you, the structures and organization to actually do it as a school leader — it is an absolute tool for me to be able to successfully turn around an entire culture and climate in the school. I just get really excited about all the things that we’re going to be able to do. Conversations have been so much easier when you’re giving feedback to a teacher. You just bring in the brain science to the conversation. That’s been really helpful to have that resource, that backbone in the conversation. It’s an additional tool in your toolkit as a leader to have that backup using the brain science data. It’s not telling us any lies. That’s so strong to have and to use. I use it all the time. THE 180: If there were one big idea that you wish your teachers and school staff could keep top of mind at all times, what would that be? ANNA KRUGHOFF: We are using “calm, nurturing, safe,” that is our school environment. So I’ll always ask those questions. “Was your interaction with students calm? Was it safe? Was it nurturing?” I use that a lot. It’s our framework for our building — that’s the matrix that we’re using for our common areas. That language has been really helpful. THE 180: What are the common areas in your school that you’re paying the most attention to now? ANNA KRUGHOFF: Cafeteria and recess. We did a huge revamp of that. We’re really good at rewarding for academic behaviors, but not so much the social-emotional behaviors in times that are challenging, recess and lunch being examples. THE 180: What do you think is most important for students to learn in school to be successful in life? ANNA KRUGHOFF: Courage and trustworthiness. The courage to take on a new initiative. We want our kids to have the courage to learn new things, to try new things, to be trustworthy citizens. THE 180: What advice would you have for a school leader who may be thinking about working with Turnaround? ANNA KRUGHOFF: Make sure that the school leader has that growth mindset and understanding. This is work, but it’s going to really shift your climate and culture, and then that will hopefully funnel into classrooms as well as adult interactions. THE 180: Is it your thinking that what Turnaround brings to the table is something schools need? ANNA KRUGHOFF: Absolutely. For me it’s non-negotiable.